Cheddar and Bacon Twice-Baked Potatoes are pillows of potato perfection you and your next steak will enjoy cozying up to! There’s only one thing better than a perfect baked potato and that’s twice-baked potatoes. Cheddar and Bacon Twice-Baked Potatoes are an easy make-ahead side dish that delivers pure comfort. Although the process takes a fair amount of time, it’s mostly hands-off time that will allow you to do other things while the potatoes are baking. With the recent popularity of low-carbohydrate diets, the nutritional reputation of potatoes has taken a beating. While it’s true they are mainly a starch, they also contain high levels of vitamins C and B6, minerals such as potassium and folic acid, and because of the skin, plenty of fiber. See? A health food in disguise! Okay, so that might be stretching it, but it’s a nice indulgence once in a while. Because the potato is halved instead of stuffed whole, the portion size for this indulgence is within reason. Russets are the best choice for baking and twice-baking because of their high starch content. When preparing a batch, select potatoes that are similar in size and shape for nice presentation and so they all get cooked around the same time. Wash the potatoes well and blot dry. Pierce the potatoes in eight to 10 places with a small knife or fork. This allows heat to penetrate and will prevent the potato from exploding in the oven when heat and steam build up in the interior of the potato. 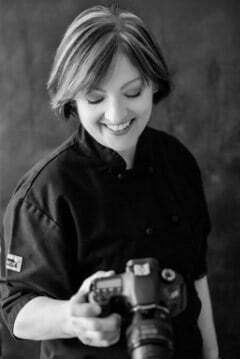 Now, I’ve baked a few bushels of potatoes over the years for my clients and here’s where I beg to differ on a number of common methods used to bake a potato. First of all, never wrap the potato in aluminum foil for two important reasons: They steam inside the foil rather than bake and second, if left inside the foil and not properly handled after cooking, they can produce the botulinum toxin because of the lack of oxygen. I also do not coat the potato in salt nor coat with any oil to help crisp the skin. I’ve found salt and oil actually act as a barrier to moisture escaping from inside the potato. Just pierce and set directly on the oven rack or on a baking sheet and let the dry heat of the oven do its thing. Once the potatoes are baked, you’ll need to work quickly; cooked potatoes are easiest to work with when warm. 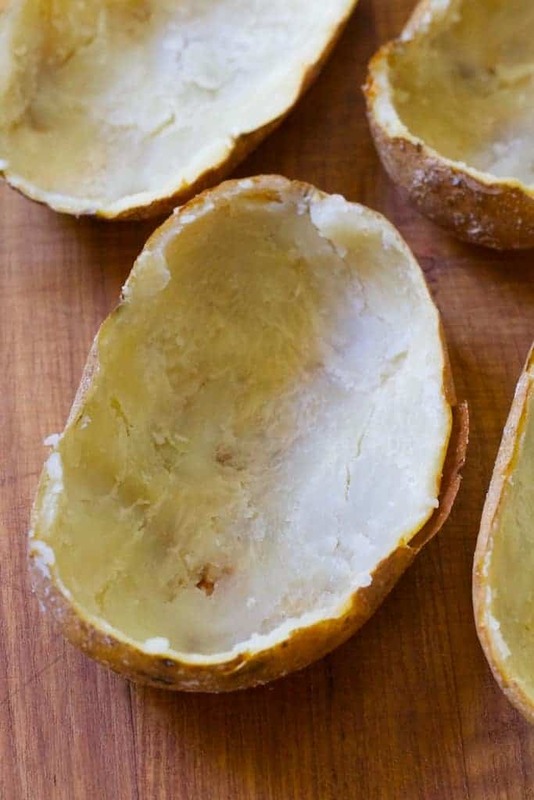 As soon as you can safely handle the cooked potato (disposable gloves help tremendously), cut the potatoes in half and scoop the pulp into a potato ricer, leaving a thin shell next to the skin. I like to use a potato ricer because it helps to produce a smooth, airy, almost souffle-like filling. However, don’t let “riced” potatoes cool before mixing in the butter or they will feel grainy. Have the melted butter ready for the potato pulp and gently fold it in before adding the buttermilk, half-and-half and other ingredients. Combining the potato pulp with melted butter before adding other dairy is a tip from America’s Test Kitchen. They say the fat in butter coats the starch molecules and helps prevent their reacting to the water in dairy which, along with over-mixing, contributes to mashed potatoes turning gummy. I’ve used this method many times and it works very well. Once filled you can thoroughly cool the potatoes and store for heating at a later time–up to two days before serving. These Cheddar and Bacon Twice-Baked Potatoes also freeze well. Just thaw and bake in the oven for best results. The buttermilk in this recipe adds a tangy flavor without all the calories of sour cream. Pour the half-and-half over the potato-butter combination, then add the buttermilk last. If added first, buttermilk has a tendency to curdle when added directly to hot potatoes. Go crazy with cheese! Other cheeses such as goat cheese, blue cheese, Gruyere or Parmesan may be used. Want another great twice-baked potato recipe? Try my Spinach Parmesan Ranch Twice-Baked Potatoes! 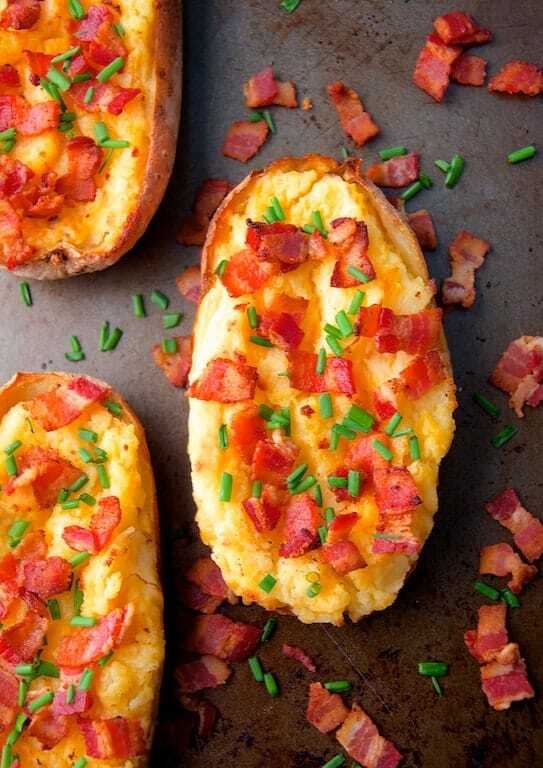 Cheddar and Bacon Twice-Baked Potatoes are pillows of potato perfection! Bake for 1-1 1/2 hours or until easily pierced with a knife. Cut the potatoes in half lengthwise and scoop the pulp into a potato ricer, leaving a 1/8-inch thick shell. Press pulp into a bowl. Immediately fold in the melted butter then add half-and-half and buttermilk, cheese, salt and black pepper to taste. Be careful to not over-mix. MAKE AHEAD: Potatoes can be stuffed and refrigerated up to one day ahead. Increase baking time by 15 minutes as they'll be good and cold. FREEZER-FRIENDLY: Cool thoroughly then place in an airtight container. Freeze up to three months.